The cheer season is finally over on wednesday! Kept waiting for more photos to go on facebook but like don't have leh, so before I forget blog a little about this first! 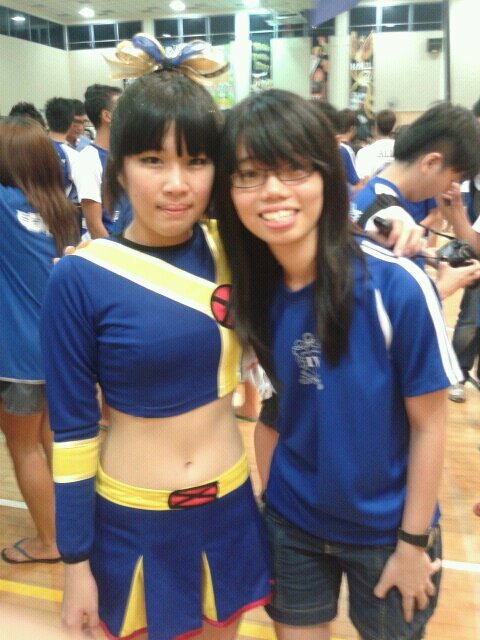 All the trainings and stuffs have really paid off, and I was super duper happy after we performed!! I almost dropped down once on the toss to hands stunt during arabesque, but luckily never!! Happy happy! Love my team, and especially my bases - alan, tikkoon and wilson. They have to endure my weight and falls and stuffs throughout all the trainings! Luckily all went well on D-DAY! The sastisfaction after the performance is really undescribable! We got 13th, but I believe its like 1st to all of us. Super thankful to all the hall people and friends that came down to support and those send me encouraging texts! Anyway, this has became my most watched video on youtube! :D LIKES X100000000! shall blog again if I find more photos online muahaha. 13FEB2012: I keep camping for photos online, then just realised got a few photos in my camera lol. Glitter spangles on our eyelids that day! The ribbon! Plus glitter spam in the hair!